Make no mistake about it. The college football world would have never focused on little ole UCF were it not for the yappiest little dog of all, the squeaky wheel himself, UCF Athletic Director Danny White. It was White that proclaimed UCF as national champion last year after the Knights beat Auburn in the Peach Bowl. The UCF faithful ate it up. 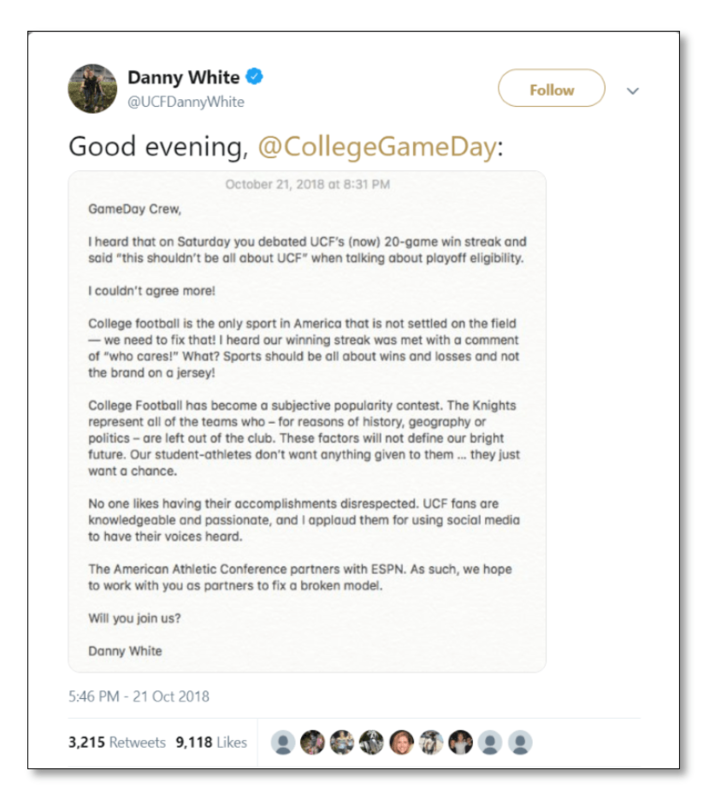 This year White engaged ESPN’s Gameday crew on Twitter calling them out for the disrespect he feels like UCF is getting. Now Gameday is coming to UCF as the Knights get ready to take on Cincinnati in a game where the stakes could not be higher. This could be a major win for the program both on and off the field. UCF will get a three hour promotional video showcasing their campus and program. The campus is a perfect fit for this type of event because UCF has what’s called “the Memory Mall,” a giant open space on campus where 5,000 fans will easily fit, making a great venue for the show. It is also an opportunity to show the Gameday bunch that UCF’s facilities are better than many Power 5 schools. Finally, ESPN is sending it’s top crew–Chris Fowler and Kirk Herbstreit–to call the national telecast at 8pm on ABC. UCF could not ask for a better opportunity. Now the Knights have to take advantage of it. 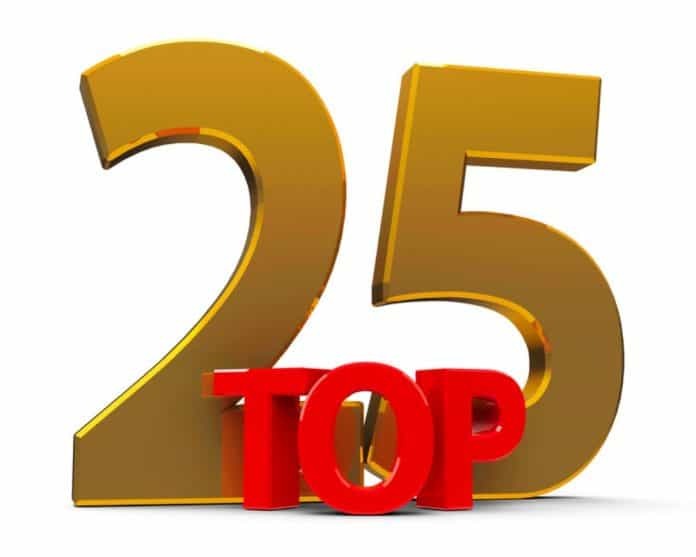 Here is my Top 25 for the week beginning November 11th. Alabama (10-0) The only question is can Tua’s knee hold up? They could still win it all with Jalen Hurts. Clemson (10-0) Were it not for a late surge, Clemson would have held Boston College to under 100 yards for the entire game! Notre Dame (10-0) No starting QB? No problem if you’re playing Florida State. Michigan (9-1) Indiana and Ohio State elimination games are left. Georgia (9-1) Already won the SEC East. West Virginia (8-1) Steamrolled fading TCU. Washington State (9-1) Got back on track after close call with Cal. Colorado was not a challenge. UCF (9-0) Now they’ll finally play a ranked team. Will beating the Bearcats get them any respect? Ohio State (9-1) Slogged their way to a win over Michigan State. Oklahoma (9-1) Tried to throw away their season against arch rival Oklahoma State. No defense at all. LSU (8-2) Favored by 13, their running back fell down to run out the clock when up by a touchdown. A gambler’s nightmare but the right play. Texas (7-3) Almost gave up a big comeback to Texas Tech. Cincinnati (9-1) Have been up and down on them all season. Currently up on the Bearcats now that UCLA at least seems average and the USF win was at decent one. Syracuse (8-2) Best win is over NC State so not sure about them other than they played Clemson really tough. Penn State (7-3) Still a quite dangerous team with a good win over Wisconsin. Washington (7-3) Still can ruin Washington State’s year in the Apple Cup. Utah State (9-1) Scored another 62 this week. How would they fare versus Florida? Florida (7-3) Miracle comeback saved them against South Carolina. Utah (7-3) Bounced back into poll by putting it on Oregon. Kentucky (7-3) Yes, I have them below Florida. They have not beaten anyone as good as LSU. Boston College (7-3) Good team, just not good enough to hang with Clemson without their starting QB. Iowa State (6-3) Have won five in a row and beaten West Virginia. NC State (6-3) They really don’t have good enough wins to be here. Mississippi State (6-4) They’r here because they beat the other two 6-4 teams I considered: Texas A&M and Auburn. Boise State (8-2) Enjoyed their terrific comeback against Fresno.